In the wake of the announcement that HP would cease production of the HP TouchPad tablet, and cease development of the WebOS operating system that powers it, HP is dramatically slashing prices on the device. This effort is to, basically, clean out inventory and get this monkey off the back of HP. The company is ready to eject their efforts at competing in the tablet space and focus instead on more leveraged efforts. A recent “interest chart” shows that Apple’s iPad has a commanding lead with consumer interest. Something that HP has decided is not worth the time and resources to compete against. The pricing slash got kicked off in Canada at the Best Buy Canada site where the 16 GB TouchPad was selling for $99.99, compared to its previous price of $399.99 and the 32 GB version of the device has had its price cut from $499.99 to $149.99. Prices at Amazon are still at the normal retail price. 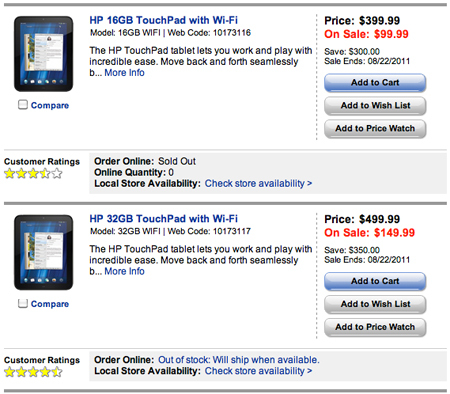 The 32 GB TouchPad is $475.30 and the 16 GB TouchPad is $399.99.